About S.P.L.A.T. - S.P.L.A.T. 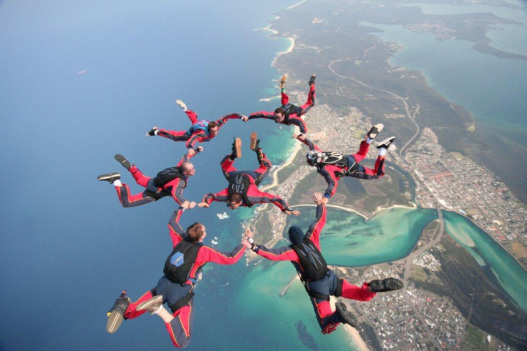 Skydiving Co.
Our name tells you the basics of how to skydive. Once you are fully equipped and have knowledge of all the safety precautions it is pretty simple from there. First when in the plane and are about to jump you first squat (S) in the preparation of the jump. You next pray (P) by putting your hands together in front of your chest so that your hands will cut through the initial air stream preventing your body from being thrown around when you next, leap (L) from the plane as you begin to descend towards the land. The "Ahhhh" (A) is the sound most of our first time jumpers will make while free falling towards the Earth before then deploying their parachute which leads to the final step. Touchdown (T) no not like the ones in football, but instead the touchdown of your feet to the ground where you are finally out of what we call the danger zone. Some people are even so thrilled by this point that they may celebrate as if the had just scored an actual touchdown in a football game and could possibly put on a little song and dance in their celebration.